Nestled on the banks of the River Brahmaputra, lost to tall thickets of elephant grass, marshlands and wooded hills, is a teeming world of biodiversity: the Kaziranga National Park (KNP) in India’s northeastern state of Assam. This UNESCO World Heritage site has emerged as the global stronghold of the greater one-horned rhinoceros (Rhinoceros unicornis). The rolling hills and dense grasslands that allow rhinos to flourish also form an ideal habitat for their primary predator – human poachers on the hunt for rhino horn. Last month, two rhinos were killed in quick succession, taking the official toll of poaching to 18 in 2016, compared to 17 during the preceding year. On Dec. 22, poachers in the park’s Bagori range shot down a male sub-adult rhinoceros estimated to be around ten years old. This brazen killing occurred in the vicinity of the Amkathoni and Daflang anti-poaching camps in the early hours of morning. Hearing gun shots, forest guards rushed to the site, but the poachers managed to flee into the thick fog after chopping off the pachyderm’s horn. Later, forest personnel recovered the animal’s carcass from a nearby pond. A used cartridge from a .303 caliber rifle was also found near the site — about 5 km from National Highway 37 passing through the park. This was preceded by a similar incident, taking place in the early hours of Dec. 14, in the western range of Burapahar. Along with the dehorned body of a nine-year-old male, park officials recovered about a dozen cartridges from an AK-47 rifle. The use of such sophisticated weapons points to the involvement of insurgent outfits in rhino poaching, another worrying trend. One-horned rhinos, an IUCN Red Listed species, enjoy a population density of about 5.59 per square kilometer (14.5 per square mile) of KNP — the highest in the world. The 2015 rhino census counted 2,401 rhinos in the 429-square-kilometer park (165.6 square miles), up from 2,329 in 2013. But even with this conservation success story, unicorns in Kaziranga continue to be vulnerable to poachers. Burgeoning demand for rhino horns — particularly in the markets of Vietnam and China, where they are used in traditional medicines or as status symbols — have made their trade more and more lucrative in recent years. Time and time again, poachers are lured to the “rhino capital” of Kaziranga. “The topography of the park is to an extent responsible,” Satyendra Singh, field director of KNP told Mongabay. The River Brahmaputra delineates its northern boundary, while the southern precinct is flanked by the Karbi Anglong hills, giving poachers relatively easy access to all five of the park’s ranges. While the northernmost range can be entered from across the Brahmaputra, the Karbi hills make it even easier for the poachers to slip into the other four, and provide them with easy hideouts. 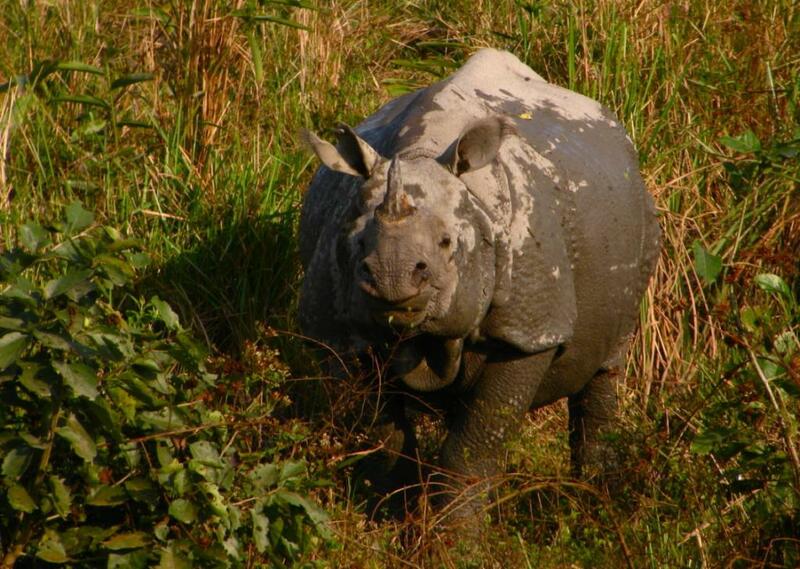 According to Anupam Sarmah, head of WWF-India’s Assam Landscape project, the very presence of such a large number of rhinos in the park, and the ease with which they can be poached, cause them to be vulnerable. On the flip side, Sarmah pointed to an interesting side benefit to this trend: Compared to rhinos, Kaziranga’s royal Bengal tigers, who also enjoy what may be the highest global density for their species (12.72 per 100 square kilometers, or 33 per hundred square miles) are difficult to hunt and therefore less attractive to poachers. Tigers are, in a sense, protected by the abundance of easier pickings. “Killing a rhino requires the least [amount] of skill and time. Once spotted, the animal can be easily targeted and shot from a point-blank range (as close as 10 feet), following which the horns are quickly axed off. So, within minutes, it is all over and poachers are able to decamp with the booty,” he said. In response to the ever-present threat of poaching, Kaziranga’s forest personnel are fighting a “grim war” to save the pachyderms. Singh, the park’s field director, said the anti-poaching drive has been intensified with 1,247 personnel, a number that includes forest guards as well as other park staffers. They are deployed on round-the-clock vigils, patrolling by foot, elephant, vehicle and boat. Two Belgian Malinois dogs and their trainers are also a part of their team. The park contains 178 anti-poaching camps, including floating ones on the Brahmaputra and adjoining streams. Electronic Eye surveillance cameras are also used to step up continuous monitoring of the park. Joint operations by police and forest guards in 2016 led to the arrest of 64 poachers, including their assistants. Of these, Singh told Mongabay, five were killed during encounters. The most recent arrest took place on Dec. 27, when one of the alleged masterminds, Chandan Das, was caught near the border of Arunachal Pradesh (a state north of Assam). Later, Das’s statement led to the arrest of two of his alleged accomplices in the October 2016 killing of a rhino in the Kaziranga’s Biswanath range. A .303 caliber rifle was also seized from them. Simultaneously, the forest department took firm steps to tone up its anti-poaching mechanisms. Last month, on the orders of the state forest minister Pramila Rani Brahma, it suspended seven forest guards on charges of negligence of duty. The suspended rangers had previously been deployed in Amkathani and Daflang anti-poaching camps in the Bagori range, the site of the Dec. 22 poaching incident. Three more forest guards were suspended earlier in 2016, in July and August, for dereliction of their duties and failure to nab poachers. “Rhino poaching in KNP has a yet another dimension,” said Uttam Saikia, a local journalist and resident, who follows trends in the park and its surroundings. There are more than 150 villages fringing the park, and the poor socio-economic conditions of the local communities further abet poaching. Poachers usually come in groups of six or seven from the neighboring states of Nagaland and Manipur, Saikia explained. These outsiders don’t know the park landscape and approach the local communities to guide them through the difficult terrain. This ensures quick and easy money for the poor villagers, who are lured into working for poachers. Such incidents, Saikia said, normally peak during the festive seasons when the need for money is greatest. In September 2016, based on a High Court order, the Assam Government evicted about 350 families from three villages fringing the park: Banderdubi, Deuchur-chang and Palkhowa. Reports described the evicted villagers as Bangladeshi infiltrators, “illegally encroaching upon the park.” A man and a woman were killed, and several others left injured, during protests against the drive. The evictions were condemned as “inhuman” by activists and opposition parties, and the government has been served notice from both the national and the Assam State human rights commissions. However, they appear to have support from forest officials and local conservationists. Adding to these challenges is the involvement of banned insurgency groups in rhino poaching – India’s northeastern states are home to a variety of armed separatist and insurgent groups. “The use of AK-47 and other sophisticated weapons in poaching activities are evidence enough in this regard,” said KNP Field Director Singh. Saikia added: “Animal parts, including rhino horns, are hotly bartered by the terrorist groups with international arms vendors, for acquiring sophisticated weapons as AK-47 and others.” These groups apparently operate through their agents, who once again make inroads into the park through local “helpers,” Saikia added. Most of these horns first land at Dimapur, in the state of Nagaland, about 150 kilometers (93 miles) from Kaziranga by road. This is the initial transit point, where the poachers are paid and from where the horns are whisked off to Manipur, said Rahul Dutta, consultant on wildlife trade and crime for the International Rhino Foundation. From there, Dutta said, they cross the porous borders to reach Myanmar — a hub in the international wildlife trade. Conservationists have not given up hope, and suggest long-term solutions for securing the future of rhinos in Kaziranga. “The prospects of KNP largely depend on how we can eventually protect the surrounding Karbi hills,” said Lahkar. Although they fall under two different local administrations, Kaziranga and the Karbi Anglong landscape have to be considered in contiguity when it comes to the protection and conservation of KNP, he explained. Together, the 25,000-square-kilometer (9,600-square-mile) Kaziranga-Karbi Anglong Landscape is an integral part of the Indo-Burma biodiversity hotspot and there needs to be greater cooperation and coordination between the two local administrations that govern it, Lahkar said. Officials need to spread awareness of the importance of the site among local communities, and build a more intensive and extensive intelligence with the help of surrounding villagers and other agencies. Youths from the villages bordering rhino ranges should be recruited as forest guards, suggested Bibhab Talukdar, chair of the IUCN Species Survival Commission at the Asian Rhino Specialist Group and the Asian rhino coordinator for the International Rhino Foundation. They know the terrain and can help garner the support of local communities in protecting vulnerable sites. Then, to ensure guards can keep pace with the agility of the poachers, older field staff (52 years and above) should be systematically phased out from rhino-bearing area and replaced with better trained young forest guards from among the new recruits, added Talukdar, who is also the Secretary General of Aranyak, a conservation nonprofit in Assam. Talukdar also called on enforcement agencies to secure more convictions of arrested poachers by engaging the best legal practitioners to win the poaching cases for the government. “We need to strengthen our investigations and evidence-gathering mechanisms. Only then the judiciary can come to a fruitful conclusion of sending the poachers behind bars for years,” he said. In pursuit of this goal, the state government is on its way to adopting the Rhino DNA Indexing System (RhODIS). With this technology, an individual rhino’s unique DNA profile is compiled in a ready-to-reference database. “This will certainly help in poaching investigations, by connecting the dots between the points of confiscation and the source of rhino killing,” said the WWF’s Sarmah. The system is already being used successfully in Africa to investigate and prosecute offenders in rhino poaching cases, and the Wildlife Institute of India (under India’s Environment Ministry) is currently working towards establishing a laboratory in the institute. Even as the challenges multiply in KNP, their solutions are never too far behind. One-horned rhinos are the pride of the nation and when their horns are being used to fund several terrorist organizations in the country, their poaching becomes a source of national concern as well, said Rahul Dutta. He called for wildlife crimes to be prioritized at the state and national level, and greater involvement from all of India’s law enforcement agencies. “The need of the hour is for a concerted multi-state action involving Arunachal Pradesh, Nagaland, Manipur and Mizoram, all of which share borders with Assam as well as Myanmar,” Dutta said. This story was first published on Mongabay. Read the original article here.